Sign up today so we can stay in touch! We caught up with blue ribbon baker Karen Cope this week at the Minnesota State Fair. She brought samples of her favorite recipe of late: Monster Cookies! We took a taste and can definitely attest to their deliciousness. 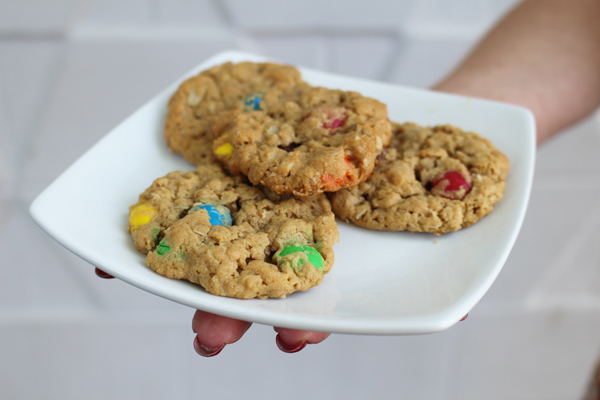 I grew up making all kinds of simple cookies: chocolate chip, peanut butter, oatmeal cookies, and of course Monster Cookies. I am a big fan of them, and they are a great go-to, crowd pleasing treat. Karen pointed out that if you eat gluten-free, all the ingredients are naturally gluten free. So unless you mix in something that’s not, you are set. Karen’s other tip was to customize your cookies. Mix in 2 cups of your favorite mix-ins like chopped nuts, dried fruits, and, baking chips. My tip is to make them monster sized because everyone’s going to love them! They also make a good size batch, so enjoy! Karen hit a milestone and major achievement this year and won Supreme Baker of the Kitchen at the 2017 Minnesota State Fair. If you don’t know what that means, it’s that she won the highest score out of hundreds of fellow bakers, all based on a point system for her winning entries. She won 12 ribbons in total this year. 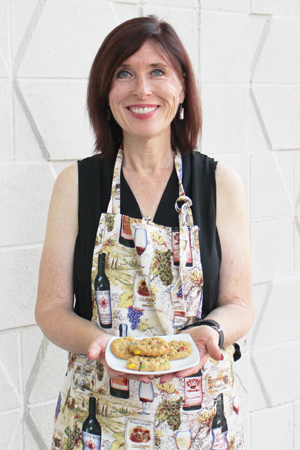 If we’re lucky, maybe Karen will share more of her recipes and tips in the future. I’m looking forward to that already. Preheat the oven to 350 degrees F. Line cookie sheets with parchment paper. In a large mixing bowl, combine the granulated sugar, brown sugar, butter, and peanut butter. Beat about 3 minutes on medium speed to cream. Add the eggs, salt, vanilla extract and baking soda and mix to combine. Add the oats. Stir in raisins and M&M’s. Drop by a 1 1/2-inch scoop on cookie sheets. Flatten slightly. Bake for 8 – 10 minutes until edges are set and cookies are a light golden brown. Cool. Makes about 6 dozen cookies.